One of several projects we’ve been working on with Toyota is the design of the ’50 years in the UK’ logo. The logo will be used across a wide range of Toyota marketing materials, videos and on the official UK blog. The negative space in the ‘5’ is created by using a 1965 Corona and a 2015 GT86 to show the historic and new. Toyota approached Progression Design to help create an all-encompassing micro website for their Toyota blog. The site’s purpose being to explain the Toyota business model of how they take a piece of solid steel and eventually turn it into a car – in 10 steps. 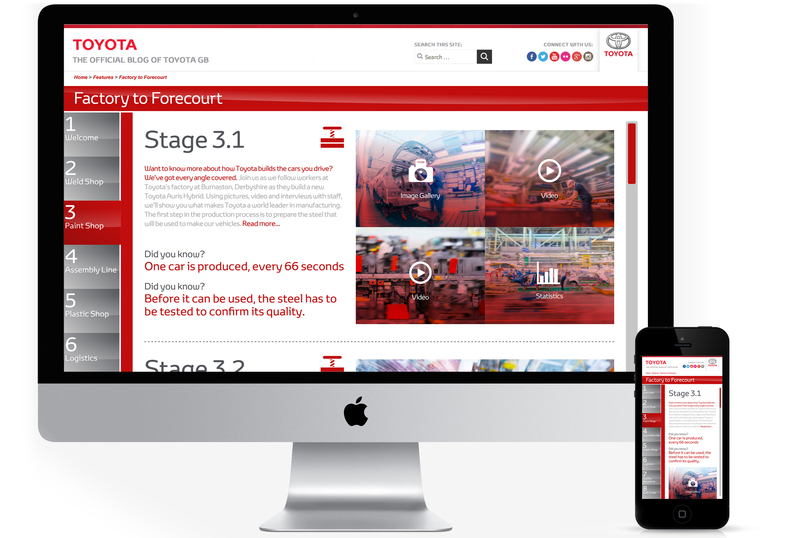 The challenge was to create a site that brought multiple information (video, blog pieces, photography and inforgraphics) together in an easy to follow format, which would appeal to a wide audience of users; students looking to understand the Toyota production method in a simple to follow way, right through to journalists, writers and professional people looking for specific information. The resulting site uses a simple 10 step menu, but within each step users are able to click through to video, additional information and imagery if they require it. This allows the site to work as both an overview and a resource for the wide range of users. The micro website is fully optimised to work equally as well on mobile and tablet. The site’s been extremely successful, with viewing figures double that of the site’s predecessor.